I hesitate to say trust falls, but it seemed like a catchy title (and this gif from Mean Girls is great). I will be talking about falling into discoveries of the archaeological kind, however. They may have actually looked a little like when Gretchen Weiners fell. Except sandier. And with a horse. And no women. One of the best parts about the history of archaeology is that it does lend itself to a bit of adventure. It seems there is always a new place to go, a new tunnel to crawl through, or a new tomb to enter. How to find these new and hidden places? Well, in the late 19th and early 20th century, sometimes they just fell into them. As I’ve been doing my latest research, I’ve run across a few of these stories and I couldn’t resist sharing them. I’m also sharing them in the hopes that there are other stories like these falling ones out there and we can keep a collection of them. What lesson do they teach us? Since they’re accidents, as a scholar I can’t reasonably draw something from them historically. Except maybe the idea that especially when dealing with a science that depends upon underground discovery for its theory, we should watch our steps. I can’t resist sharing my favorite legend of falling in Egypt. There are a number of legends for why the city of Cairo (al-Qahira) was founded where it was. One of them contains a fall (maybe a foreshadowing). When the Fatimid general Jawhar conquered Egypt in 969 AD, he decided upon the placing of his new palace city because his horse tripped on something in the sand–a large bag of gold, it just so happened–causing Jawhar to fall off the horse. He dug up the bag and then decided that that place should be the new capital and that gold should help fund the building of his palace. * We can all see how that story is going. 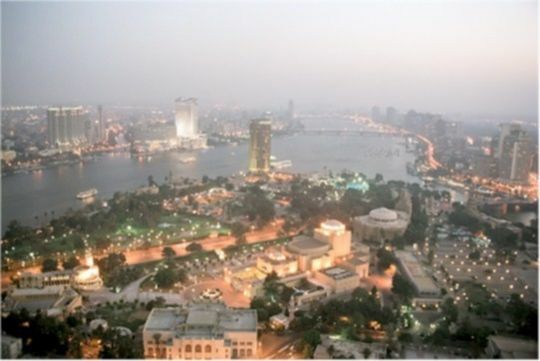 Cairo is an amazing city with a huge and diverse population. It’s one of my top 5 places in the world to go. That story aside, there are others that are, for the most part, true. Jason Thompson’s 2nd volume of Wonderful Things told of the time in 1898 that Howard Carter was riding his horse near Deir al-Bahari near Luxor, Egypt, and his horse stepped into a hole, throwing Carter off. Carter later wrote (and I’m quoting from Thompson, p. 75) “Afterwards, on looking into the small hole there formed, I saw traces of stone work, from which I concluded that there must be something and most probably a tomb.” But he could not do anything about it until he got concession for the area and some funding to dig. The excavation of what Carter named “Bab al-Hosan” or the “Gate of the Horse” happened in 1900. He found a massive underground complex which contained very little except two sealed chambers. 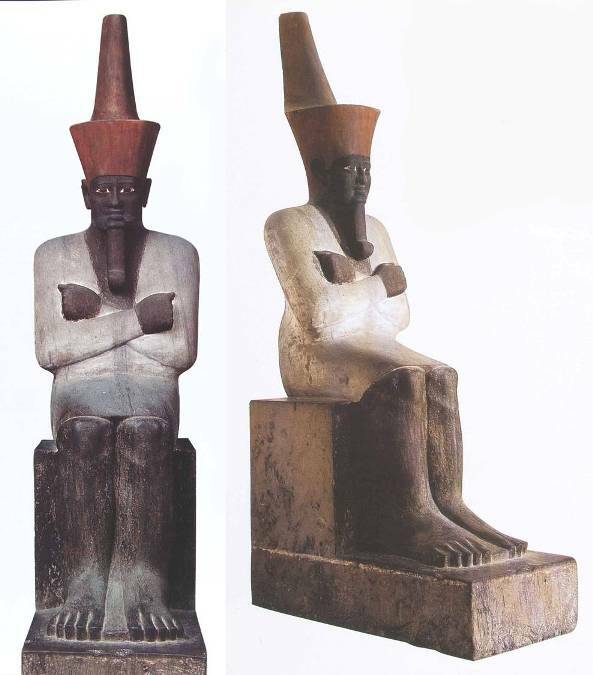 One held a seated statue of Nebhepetre Mentuhotep, the first king of the united Middle Kingdom (c. 2051-2000 BC), and the other held nothing but pottery and a few wooden boats. In the end, it is believed that the complex may have started as a tomb but then abandoned later. But there is no consensus. Another (relatively true) tale of a fall bringing about archaeological discovery is from the Catacombs at Kom el-Shoqafa (or “hill of potsherds”) in Alexandria. For decades the area near these tombs had been a quarry and no one knew the tombs were buried underneath. In late September of 1900, a worker was pulling a donkey and cart full of quarried rock across the site. His donkey slipped and disappeared into a hole in the ground. He then reported the fall and find to the local museum (Greco-Roman Egypt Museum) in Alexandria. When the Egyptologists Botti and Scheiss-Bey entered the hole, they found what are now the famous Catacombs near the place of Pompey’s Pillar. They excavated the site, finished clearing debris within a few years, and found what Baedeker’s Guide to Egypt called in 1902 “an admirable example of the characteristic Alexandrian fusion of the Egyptian and Graeco-Roman styles” (1902 edition, p 13). Just a few years before this, Baedeker’s had told its readers that the whole area would not exist much longer due to extensive quarrying. Now this important example of Greco-Roman funerary architecture is open to visitors each day. Are there others like this? What about in your field? Help me find them! *I heard this story on a tour in Old Cairo in 2010 so I may be misremembering it. What I do know is that a horse, a fall from a horse, and finding gold were all part of the legend. It seemed also that the gold was real, so Jawhar had some explaining to do as to where he found the gold. This story did the trick. For other legends about the founding of Cairo, see James E. Lindsay’s Daily Life in the Medieval Islamic World (Westport, Conn.: Greenwood Press, 2005), 103-106. This entry was posted in Egyptology, excavation and tagged Egyptology, excavation. Bookmark the permalink. What I love about Egyptology is how off the scale it all is! Coming at archaeology from Europe, and the very edge of Europe at that, what struck me here was ‘contained very little except two sealed chambers … nothing but pottery and a few wooden boats’ Oh, if only! Didn’t Pompeii or Herculaneum get discovered by someone falling in? I should know, I taught it last semester! And, I’m sure there’s something about London too – I’ll look it up. I think you’re right about Pompeii! Do look it up. That’s great! Oh, and one thing I didn’t add was that poor Carter thought the second sealed chamber was going to be packed with stuff and he invited Lord Cromer to come watch the opening. Not unlike Geraldo Rivera when they opened Al Capone’s safe (or whatever it was). And he was SO embarrassed when it was empty. Falling into archaeology. . .